Dr. Steven Valentino is a board-certified orthopedic surgeon who is fellowship-trained in spine, which is the highest level of medical education possible in the United States. The difference between a M.D. degree (Medical Doctor) and D.O. Degree (Doctor of Osteopathic Medicine) is that osteopathic doctors have additional training in the structure of the musculoskeletal system, including how movement or manipulation can in some cases relieve pain symptoms. Both M.D.s and D.O.s can prescribe medicine, and orthopedic surgeon M.D.s and D.O.s perform the same surgeries. Fellowship-training related to spine surgery is typically identical between both MD and DO degrees. Dr. Valentino has practiced orthopedic surgery specializing in spine in the Philadelphia and South Jersey region for more than 25 years. Over that period, he has performed more than 5,000 successful spine surgeries. He was one of the first surgeons in the Philadelphia / South Jersey region to be trained in minimally invasive spine surgery and artificial disc replacement surgery. His Doctor of Osteopathic Medicine degree was received in 1982 from the Philadelphia College of Osteopathic Medicine. He is a graduate of LaSalle College and Bishop Neumann High School, both in Philadelphia. In addition to being a Board-Certified Orthopedic Surgeon, Dr. Valentino is also Board-Certified by the American Academy of Disability Evaluating Physicians, and Board-Certified by the American Board of Independent Medical Examiners. He is trained to perform Independent Medical Examinations and to provide Impairment Ratings related to on-the-job injury. He has written dozens of professional papers and presentations for publication on the subjects of back and neck pain; back injury in the workplace; back injury in sports; non-surgical spine care options and spine surgery. He is licensed in Pennsylvania and New Jersey. Philosophically, Dr. Valentino has a conservative approach to the care of his patients and encourages non-surgical treatment first. This is in contrast to many other spine surgeons who may be biased toward spine surgery because of their limited experience with non-surgical treatment options. Because Dr. Valentino is proficient with the use of spinal injections to relieve symptoms of a herniated disc, it enables him to explore non-surgical treatment options more so than other surgeons who aren’t familiar with that specialty. Dr. Valentino is a caring physician with a long track record of customizing care plans for his patients. This specialized spine care results in successful patient outcomes. The philosophy of the spine care team at Liberty Spine Care is that many patients in our experience will get better with rest, medication that reduces inflammation, core strengthening and spine-specialized physical therapy programs. The Liberty Spine Care philosophy is to focus on the whole person, not just the problem area, because there can be other psychosocial issues that can influence pain symptoms, responsiveness to various treatment options and one’s desire to return to activity. We believe the quality healthcare comes from a well-informed patient who is educated to exhaust non-surgical treatment options first, and to understand the impact of their treatment decisions. For example, as a community service Liberty Spine Care provides a free 36-page Home Remedy Book to those with back and neck pain. Copies of this educational book are also provided to family practice physicians for distribution to their patients. The Home Remedy Book features symptom charts that reveal what red flag symptoms need to be seen immediately to prevent permanent paralysis, exercises and stretches that can relieve some simple pain symptoms, and other pain-relief remedies that can be done at no expense in one’s own home. 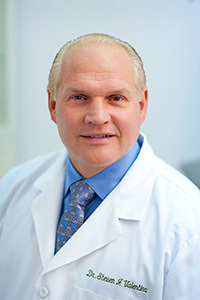 Dr. Steven Valentino has extensive experience in minimally invasive spine procedures. In minimally invasive spine surgery, a smaller incision is made, sometimes only a half-inch in length. The surgeon inserts special surgical instruments through these tiny incisions to access the damaged disc in the spine. Entry and repair to the damaged disc or vertebrae is achieved without harming nearby muscles and tissues when using minimally invasive techniques. Minimally invasive spine surgery requires extensive training and experience to master use of the tools, but there is tremendous benefit for the patient.